EMF Motor presents the world's most efficient torque motor with patented PM technology wich offers perfect solutions for cooling tower application. Our patented motor technology enables us to produce gearless, high pole number (66-88-110) and very efficienct motors. It offers reliable speed control, reduced maintenance, quieter operation and unbeatable high energy saving. The fan couples directly to the motor and can be controlled by sensorless flux vector drivers. ​Due to the high number of magnetic poles, high torque is achieved with reduced rotational speed. The motor winding losses are much less than conventional high pole motors. The motor enables a high efficiency even at very low speeds. The old conventional system consisted of a 37 kW, 1470 rpm, IE2 AC motor and a gearbox with a ratio of i = 6,1. The motor and the gearbox are connected together with a shaft of (3 meters) with couplings at each end. The propeller is mounted on the gearbox and the system runs at 241 rpm. The motor is operated by a SoftStarter, with no frequency adjustment. The angle of the propeller was set to 4 degrees. The motor had a consumption of 33,5 kW. SQMC200-400 motor is choosen with 1150 Nm, 208 rpm, 25 kW. Its efficiency is for 93 % and its nominal voltage is 354 V at 62 A . Our motors are always driven by an inverter. The existing system was dismantled and replaced with the existing fan. The propeller angle was set to 8 degrees. Both system has an air speed of 10,2 m/sec and air flow is 193 m3/sec. 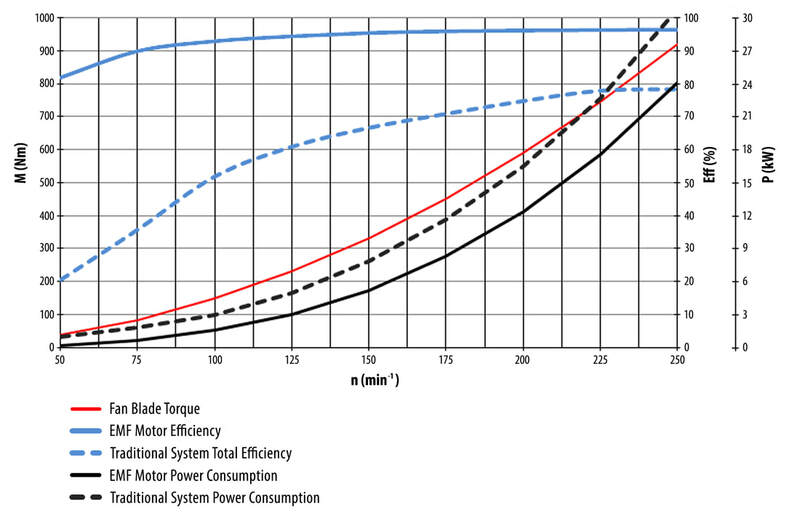 SQMC torque motors considerably reduces maintenance time and costs. Additionally, it works more reliable, quieter (6 dB less) and can be installed very easily due to its compact design. The conventional systems consume 27,6 % more energy than these environment friendly motor and so, our new system pays back very shortly. Only saving electrical cost is 4.500 €/year (electrical price: 0,06 €/h, 24 hours/360 days).